The Division 2 comes with three different version and all differ in content. What do they include and which one to choose? We've prepared a detailed version comparison for you to make your choice easier. When it comes to MMO games it's usually better to choose editions with various bonus contents and/or a Season Pass, because those who buy complete packages in advance usually save money in the end. The upcoming MMO shooter - The Division 2 will be similar and we suspect that the Ultimate Edition will be the most popular. 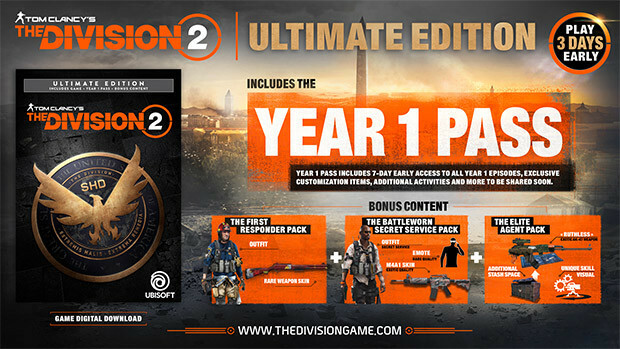 So the best choice for an unrestricted gaming experience in The Division 2 is also the Ultimate Edition, which includes the Year 1 Pass and other benefits such as 7 days of early access to the Year 1 episodes, additional activities, and exclusive customization items. Our Edition Comparison (also called Version Comparison) shows you what's in the Standard, Gold, and Ultimate editions. By the way: For every pre-order, no matter which edition you choose, we'll reserve you a place in the Private Beta and the Capitol Defender Package will be added as a bonus. To get details on these bonuses we've prepared a short guide. The First Responder Pack: be the first to answer your allies' call and fight without restraint to rescue the citizens of Washington, D.C. with a rare weapon skin for your shotgun and your brand new firefighter outfit. 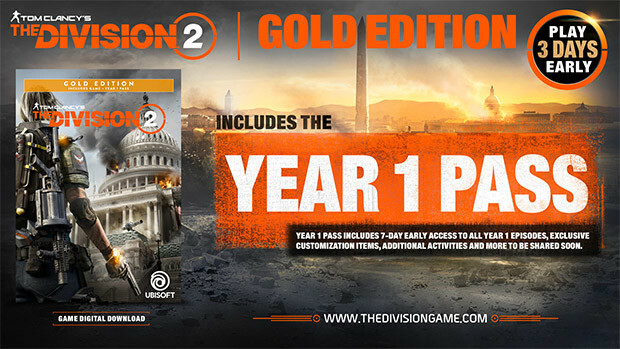 If you order The Division 2 from Gamesplanet before its release on March 15, 2019, your pre-order will reserve you a seat in the Private Beta and you'll get the Capitol Defender Package as a bonus. You will also be able to invite three friends to the beta with your secure beta access. For more information on pre-order bonuses, see The Division 2: Pre-order Bonuses Guide. Can anyone confirm that the extra stash space was removed from the ultimate bundle of Divison 2? Could you share source of that information please? As far as we know - there will be nothing removed from the ultimate bundle. According to reddit the ultimate edition does not grant the player extra stash space. You start with more but end up having the same as everyone else. I am also wondering about the benefits of the season pass. According to the same source all DLC will be free. The seaon pass only grants you access a couple of days earlier. That is hardly worth nearly 50 Euros in my opinion. Is there any way to change my preorder to the basic version once the key was used in the Uplay client?